Whether you use webinars, ebook downloads, free trials, or a contact form (or…all of these!) to generate leads, all the work you put in will be in vain if users do not click your call-to-action (CTA) buttons. You could be offering a roundtable discussion with President Obama or a chance to win a date with Sofia Vergara, but if no one clicks your CTA, it will not make any difference. Here are three elements to keep in mind when creating the all-important business-defining CTAs – key considerations when on the edge of launching your website. Web psychologist Dr. Liraz Margalit explains the psychology behind CTA color selection. She says “there is no set of hard and fast rules . . . but, color should be connected to the specific message one wants to convey.” When testing colors for your CTA, it is important to pick a color that stands out and to segment the test for the different online shopping personas. That is: it is not enough to say 20 percecnt more users click blue than green. A more insightful observation would be that 25-34 year-old professional women prefer green CTAs 20 percent more, while 35-44 year-old blue-collar men prefer the blue 40 percent more. This way, color is not viewed as an independent element and can be optimized and personalized to motivate the target audience. Moreover, this can be said about any CTA element you are optimizing. Do not view it as an independent factor. Always test it and relate to it as a part of a larger picture – one that is personalized, targeted, and must prove effective for a specific target audience. Web designers sometimes have a tendency to over-design. Time and time again, the KISS (“Keep it simply, stupid”) principle proves its worth when it comes to website conversion optimization. Contentverve reports on this experiment in which a “fancy” button was tested against one that web designers might categorize as “boring” (personally, I prefer to call it “straight-forward”). The AB test proved that a simple design: rectangular button with clear borders, white background, contrasting colors, with action-oriented wording is the way to go. You do not want users to click your button “someday”. Give them a reason to click now. Test adding time-sensitivity to your messaging (i.e. “Get my ebook” vs “Get my ebook now”). 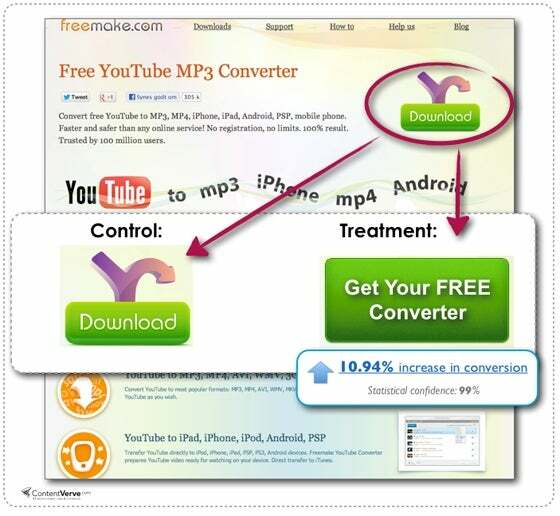 ConversionXL tested this theory brilliantly. Once Marcus Taylor aligned other important elements of his offer, he tested adding an element of urgency. Obviously, urgency works – it is used by the greatest websites. Amazon is a great examples of using urgency. For brides looking for a little extra pizzazz, the online shopping giant shows that only 17 shoe decals are left in stock. Google “CTA Best Practices” and you will get nearly 70,000 results. Is it possible that they can be summarized into just three? There are endless elements you can optimize with your CTAs: wording, color, placement, design, size, shape, and dozens more. In my experience, the most “bang for your buck” will come from optimizing all elements in relation to the target persona, making CTAs simple and straight-forward, and adding an element of urgency. These three main concepts will turn your Call-to-Action buttons into Calling-the-Right-User-to-Act-Now buttons. CRUTAN buttons, anyone? Efrat Ravid is the Chief Marketing Officer at Clicktale. She is responsible for leading worldwide marketing initiatives targeting global fortune 500 companies, as well as creating and publishing Digital Customer Experience thought leadership content for the industry.